After a stressful couple of weeks, things are finally starting to return to normal and I can breathe again! I managed to make a couple of more purchases in my recent retail therapy sessions! There have been some awesome end of financial year sales, with some fantastic deals. These embroidered jeans were originally $60 and I got them for $20. They are really comfy and I love the embroidered detailing on the leg. The kimono was originally $50 and was on sale for $20. 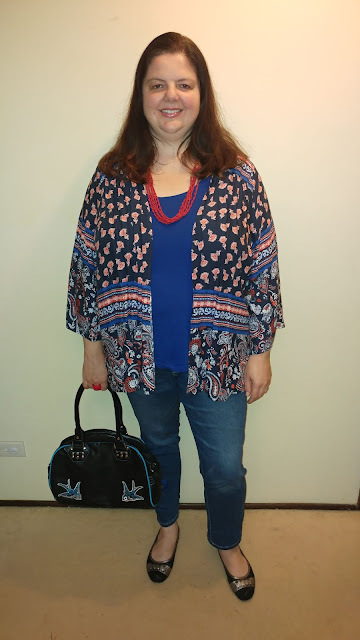 I love the colours and boho print of this kimono. I'm not going to sugar coat it: this week has been a nightmare! A hugely stressful and exhausting week. My son is sick at the moment. I won't bore you with the details but just know that it's been a tough week! I find it hard to cope with the worry of looking after him when he's unwell. In order to keep me going, some online retail therapy was necessary in the form of a new pair of shoes! I was so excited when they arrived, as I haven't been able to go out. Check them out! Aren't they cool? They're so cute and comfy. As I haven't been out of the house all week, except to take my son to the hospital, I've been wearing them around the house. Who says you can't wear cute shoes around the house?! Anyway, the outfit below is me playing dress-up at home. Hopefully soon I'll be venturing out in this exact outfit! Hopefully soon I'll also be able to get some sleep! 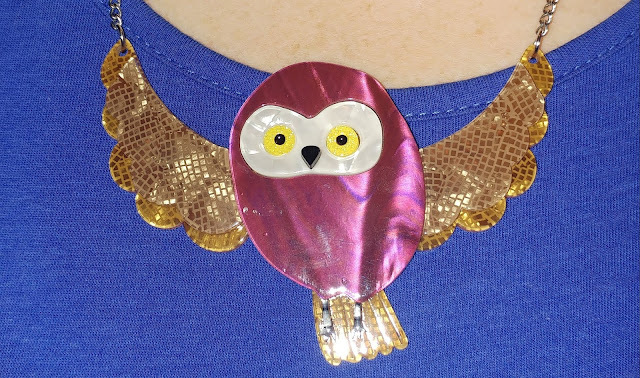 Sometimes I build my outfit around a statement necklace like this one and other times I'll add it at the last minute just to add more colour and character to my outfit. I love how sometimes if I don't know what to wear and I default to black, just by adding a necklace like this one is enough to add some pizzazz to an otherwise boring ensemble. Wearing necklaces like this make me feel more me, if that makes sense! The cold snap this week has called for multiple wears of my fave black jacket. I've had it for about ten years and it is just such a great jacket! It's not too bulky or too fleecy: it's just right. It's the Goldilocks of jackets and is perfect for winter here! 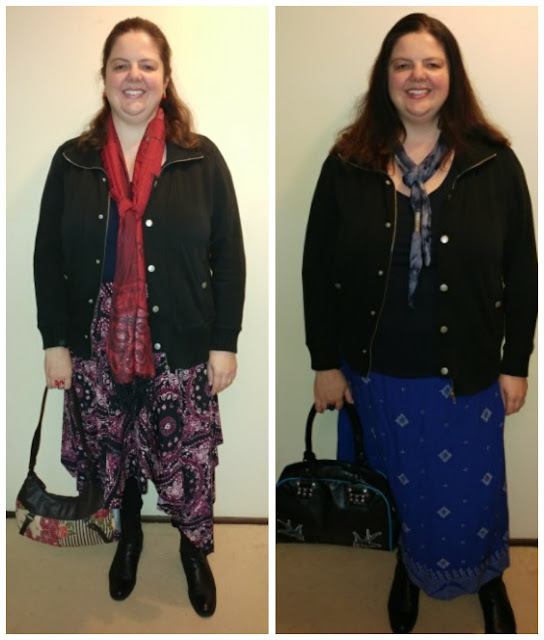 Here are two outfits I've worn this week, featuring my Goldilocks jacket! 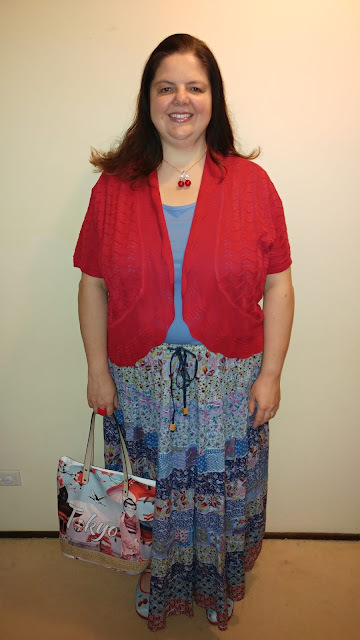 I wore this outfit last week before the cold snap. It is now officially cold! All of Australia is experiencing a cold snap at the moment and the ski resorts in the southern states have been covered in fresh powdery snow. Although it's nowhere near that cold where I live, it is definitely too cold for just a cardigan now! Today it was the coldest day we've had so far and I needed to layer up. For some reason every year winter here sneaks up on me and I suddenly find myself shivering one morning! It's because the climate here is subtropical, so the heat is to be expected but cold days still take me by surprise! 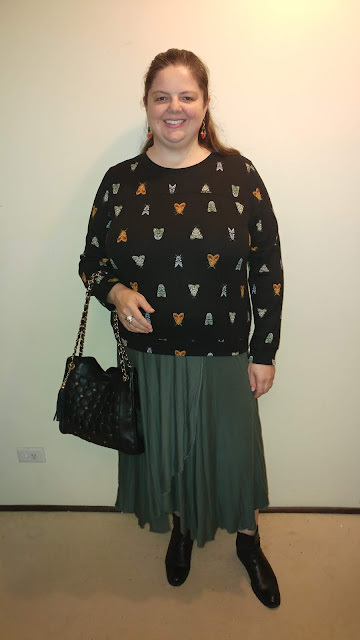 So here is my last non-rugged up outfit for June! 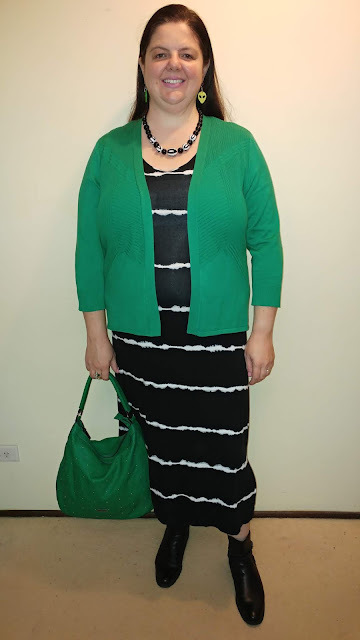 As I've mentioned before on the blog, I love a good matchy-matchy thematic outfit! With the colder weather finally here, I was excited to go through my scarves and pick one to wear. 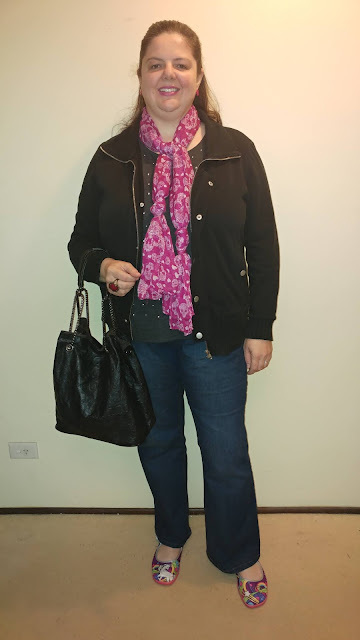 I recently bought a pair of pink skull earrings, so I thought I'd wear my pink skull scarf to complement them. Of course any good theme needs a matching bag, so I reached for my embossed skulls bag to complete the outfit! Now all I need is a pair of shoes with skulls on them to be the master of matchy-matchy!😂 I thought my unicorn shoes were a fun alternative instead! Plus, I don't want to be too predictable, right? When I first saw this top on the rack, I thought it was covered in butterflies. As I was trying it on I realised they were actually moths! I know that I was terrified of moths as a child, so I temporarily cringed at the thought of being covered in them! In spite of my childhood fears, I knew I had to have this fun and quirky design. This is me fluttering off to find my next great purchase! !